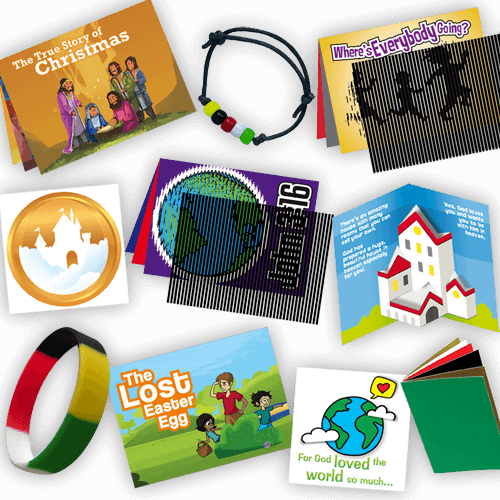 Let the Little Children Come offers a variety of evangelism tools which we are able to see a sample of in the Gospel Tracts and Evangelism Tools Sampler Pack. So many different and interactive ways to reach children with the good news of Jesus Christ. The Sampler Pack includes three different style of tracts. The Animated tract has an element to it where you put a striped piece of plastic over the photo, and it makes it come alive. (The plastic is included with the tract). Each page is a different scene asking about the Lord. At the end of each booklet it mentions how you can accept Jesus into your heart. These are perfect to hand out at Vacation Bible School, to new kids attending Sunday School class, or even for your student to take to class with them. The 2nd style of tract is the Pop Up tract. This is like a mini pop up book, so much easier on the eyes than the animated one :) Reminds me of the pop up books we read to the kids when they were younger. Each page has a pop up on it, and it about 4-5 pages in length. Each booklet ends with the salvation message and how the student can accept Christ. The third tract sent to me was the FlipAbouts. It is a paneled booklet that opens and twists about at different angles. Makes different symbols based on how you turn it. The John 3:16 one was really fun and had the verse on separate flips. My daughter and I have several pen pals, and these type of tracts work perfect to include with a letter to someone we are just meeting via snail mail. Another great tool for evangelism is the color coded bracelet. There is a silicone salvation bracelet that has each color of the story on it. It comes with a paper that explains what each of the 5 colors mean, but the bracelet is just the colors. This is actually a great conversation starter as well for my kids to wear out and about. The next bracelet they sent was the Wordless bracelet kit. This is the bracelet you may have seen them make at VBS, or church camps. With the black band, and the 5 colored beads to represent the Salvation message. The final tool was a wordless book, in the same colors as the bracelets, to witness through the colors, the salvation story. I found it interesting that Charles Spurgeon was the first to use this book in 1866 to present the gospel to children. This sampler pack allows you to physically see each item, and then take them to your youth pastor, sunday school teacher, co -op leader and then decide which tools will work best for the ministry you are trying to do. You then can order that specific item from Let the Little Children Come. With our ministry of snail mail I personally like the Pop Up Tracts to send in the mail to new friends. It is easy to just include it in a letter, and you can send a prayer along with it. See what evangelism tools the Homeschool Review Crew preferred from the Sampler Pack by clicking on the photo below.